Our trip started with our plane delayed two hours which was a slight bummer as we ‘have much time to spend in Buenos Aires on our way to Antarctica anyway! The good news is, my awesome friend Nicole upgraded me to business class for our overnight flight, and the seats fully reclined! The business class seating area on a 777 is more complicated than a car. There is a glove box and the tray table comes out from the arm rest and from the seat back in front of us and connects together. Lots of other gadgets as well. Our flight attendant was amazing. It’s been a long time since someone on AA was so nice. I was ready to tip her! The jet lag took affect when we landed. I had read about an entry tax but it sounded like we could pay it through a simple process at immigration…not so! We got booted out of the line and sent to a computer. After filling out the entire form and selecting the “add to shopping cart” button, the form promptly disappeared. Then our user names were taken. After back-paging through several screens, we retrieved our sign in page; however, we didn’t have a form according to the computer, so we got to reenter all of our information again! This time we made sure to click the “pay” button further down the screen versus the “add to cart” button. The good news is, it was so frustrating, we will not forget that we have paid the $160 entry tax for ten years! After we sat at the wrong carousel waiting on our bags, I just started laughing at us. It’s amazing what no sleep (despite a reclining seat) and a cold does to the brain sometimes! After changing some money, we found a taxi and took a long ride to our hotel, The Savoy, a lovely place. With the day half over, we finally took to the streets by foot and headed toward Recoleta, a nice neighborhood in the city. On the way, we stopped at the El Ateneo Grand Splendid bookstore with frescoed ceilings that used to be a 100 year-old theater…pretty cool! We had planned on having lunch at its cafe, but the fare was a bit light so we stopped next door at the Buenos Aires Cafe…the best beef and chicken kabobs!!! We also snacked on the contents of the bread basket which was already set on the table. Little did we know we’d have to pay for it which is the custom here. After our savory lunch, by the recommendation of many, we visited the cemetery to see Eva Peron’s grave. Of course, at the entrance, we were stopped by some guy who drew us a map of the cemetery and wanted a donation for charity. We obliged and frankly, it was the best money spent…the cemetery was enormous with rows and rows of mausoleums. While Evita’s grave, adorned with rosaries and flowers was the most famous, we found the mausoleum with the rotating, attic fan to be the most entertaining. It seemed a little unnecessary. It was also suggested to us to visit the Alvear Palace, which as it namesake suggests was once a palace and is now a hotel. On our way we passed by a gigantic El Gomero tree planted in the 1800s. It is so big, its branches has supports. After a caffeine pick me up, we turned toward Plaza San Martín where we meandered through the park and weaved our way through the sidewalk shops set up outside the train station. The square was live with buses and commuters! We had logged about five miles and opted to hoof it back to the hotel. On our way back, we stumbled upon a pedestrian only street full of shops. It seems the city, expansive and sprawling, has a little of everything…old, new, lots of graffiti, a variety of ethnicities including several nose pickers! 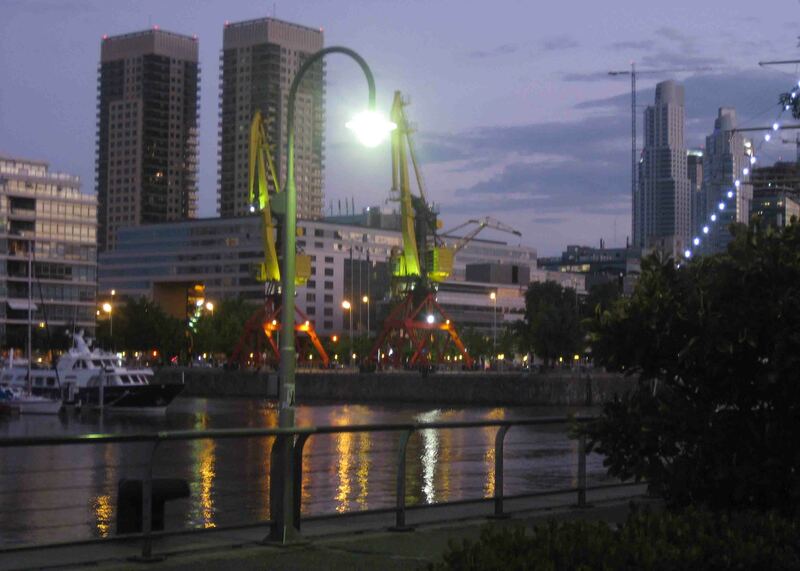 Overall, many of our friends had raved to us about Buenos Aires, though we found ourselves not entirely enthusiastic…perhaps we were just tired. We ventured out to dinner around 8:30, this is still early by Buenos Aires standards so we had an easy time getting a table on the patio at a fantastic steak restaurant, Cabaña Las Lilas, at the docks. We found out from lunch, that bread or appetizers are provided for the table and charged to the bill if they aren’t turned away without being informed. While a surprise the first time, the second time, we were hungry! I think it is a little humorous though, especially after we were provided complimentary after dinner drinks (of course we were advised of this). We also learned from lunch, ask for the check when dinner is served! The weather was lovely. We enjoyed a beautiful evening as we wandered the docks. We really enjoyed this area, and the city grew on us…a little. On to Ushuaia tomorrow…ETB. El Chalten…An Awesome Argentinian Town! Chance miller from st marks 88 lives in buenos a! Trip looks lovely! Post more! Travel safe! I am so jealous! Have a great time. Excited to finally have time to start reading these. Looks like a great first day. Best around day 6 or so! Was wondering about you on Sunday and if you made it back from CA with our blizzard!